Unsorted waste is fraught with fines. In 2018, a ban takes effect in Ukraine on the disposal of unprocessed (untreated) household waste. 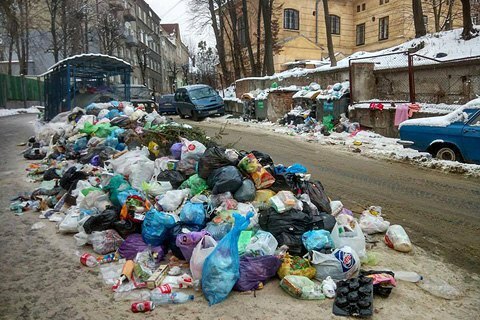 In addition, Ukrainians should now sort the garbage, separating large-scale, construction and hazardous household waste and collect it separately. Under the amended 2012 law the Law On Waste, hazardous waste must be separated at the stage of collection and taken to specialized licensed enterprises in specially equipped vehicles. Local councils on a competitive basis will select providers of services for the transport of domestic waste. The burial of domestic waste is allowed only at specially equipped landfills/dumps. During the contests, local governments or state administrations will give preference to proposals that provide for a greater degree of recycling or utilization of domestic waste. The incineration of household waste is allowed only at specially designated enterprises or facilities and only for the purposes of obtaining thermal and/or electrical energy. It is forbidden to design, construct and operate landfill sites not equipped with groundwater protection systems, extraction and neutralization of biogas and filtrate substance. The households that will dispose unseparated waste will have to pay fines from 340 to 1,360 hryvnya. Legal entities will be fined from 850 to 1700 hryvnya, which the Minister of Ecology and Natural Resources Semerak considers too small. "We will ask the parliament to significantly revise upward the relevant norms in the Administrative Code. Some such violations must be regarded as a criminal offence", he stressed speaking on 112-Ukraine TV channel. An average Ukrainian generates 10 tons of solid waste annually, which is twice as much as in the EU countries.